African American literature is over. With this provocative claim Kenneth Warren sets out to identify a distinctly African American literature--and to change the terms with which we discuss it. Rather than contest other definitions, Warren makes a clear and compelling case for understanding African American literature as creative and critical work written by black Americans within and against the strictures of Jim Crow America. 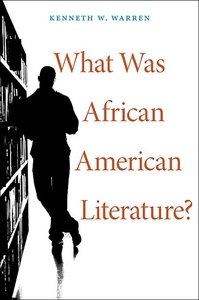 Within these parameters, his book outlines protocols of reading that best make sense of the literary works produced by African American writers and critics over the first two-thirds of the twentieth century. In Warren's view, African American literature begged the question: what would happen to this literature if and when Jim Crow was finally overthrown? Thus, imagining a world without African American literature was essential to that literature. In support of this point, Warren focuses on three moments in the history of Phylon, an important journal of African American culture. In the dialogues Phylon documents, the question of whether race would disappear as an organizing literary category emerges as shared ground for critical and literary practice. Warren also points out that while scholarship by black Americans has always been the province of a petit bourgeois elite, the strictures of Jim Crow enlisted these writers in a politics that served the race as a whole. Finally, Warren's work sheds light on the current moment in which advocates of African American solidarity insist on a past that is more productively put behind us.